The end of the Cold War appeared to revitalise the Security Council and offered the prospect of restoring the United Nations to its central role in the maintenance of international peace and security. Between the Gulf War of 1990 and the 2003 invasion of Iraq, the UN Secretariat found itself in the midst of an unprecedented period of activity involving authorised and unauthorised actions leading to the use of force. 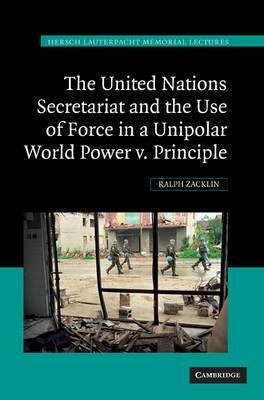 In this 2010 book Ralph Zacklin examines the tensions that developed between the Secretariat and member states, particularly the five permanent members of the Security Council, concerning the process and content of the Council's actions in the Gulf War, Bosnia, Kosovo and the Iraq War as the Secretariat strove to give effect to the fundamental principles of the Charter. Introduction; 1. The Iraq-Kuwait conflict; 2. Bosnia; 3. Kosovo; 4. The Iraq war; 5. Conclusions. '... Zacklin's book is a valuable evaluation of the practice of international law and organization as it relates to the use of force.' Gunther Auth, European Journal of International Law 'This concise book is recommended reading for anyone who is interested in the law and legal processes of international organizations but who may not have had the first hand opportunity to witness what goes on in a legal counsel's office.' Frederic L. Kirgis, American Journal of International Law "This concise book is recommended reading for anyone who is interested in the law and legal processes of international organizations but who may not have had the first hand opportunity to witness what goes on in a legal counsel's office." Ralph Zacklin joined the United Nations Office of Legal Affairs in 1973, where he was Assistant Secretary-General for Legal Affairs from 1998 to 2005.